10600 ANSI Lumen brightness are a key feature of the Panasonic PT-DS100X putting it in the event-class of projectors. With this outstanding light performance it is not only perfectly suited for your large-scale events, conferences, expos, installations, but also for other demanding applications such as screenings, fairs and permanent installations. Its 10600 ANSI Lumen and a top quality workmanship will make the Panasonic PT-DS100X much more reliable and resilient than a consumer office projector. The contrast of the Panasonic PT-DS100X comes in at a very high 10000:1. The human eye can only recognize contrast ratios of 800:1 maximum. The high contrast ratio is particularly great for very dark rooms, as black will be displayed as a deep black on a bright projector. Also the Panasonic PT-DS100X has the Edge Blending feature making it suitable for multi-screen projections. Edge blending is used when the required image size can´t be covered by a single projector. Such images can be divided and displayed with multiple projectors with Edge Blending. The Panasonic PT-DS100X is designed for professional long continuous operation in 23/7 or 24/7 mode. Only very few projectors offer this feature since it requires a very good lamp cooling system. More information on running times, maintenance intervals, etc., you can find in the manual or spec sheet of the projector. The Panasonic PT-DS100X has an ECO mode, which prolongs the lifespan of the lamp by reducing brightness, operating noise and power consumption of the projector. The lamp lifetime is 4000 hours. The current lamp running time is 101 hours. At an average of 1.5h daily operation , a new lamp will run 8 years. We offer projectors in different conditions. The Panasonic PT-DS100X shown here is in 'used' condition. This means, this device has been used before. Our experts have checked it, either cleaned it, or fitted a new lamp and confirmed its technical components are in 'as good as new' condition. There may be superficial signs of usage on the projector but that does not have any impact on its good technical condition. 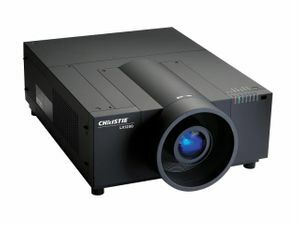 You are getting a technically first class projector at a great price discount.